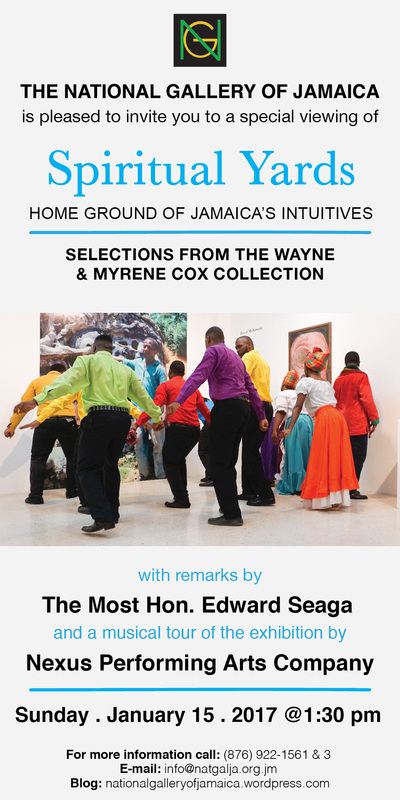 National Gallery West in Montego Bay is pleased to present Spiritual Yards, which features selected works of art and archival material from the Wayne and Myrene Cox Collection. The exhibition opens on Sunday, December 10, 2017, at 4 pm, with opening remarks by Wayne Cox. Spiritual Yards was originally shown at the National Gallery of Jamaica in Kingston and the exhibition at National Gallery West is an abridged version of the original. The National Gallery of Jamaica’s Last Sundays programme for January 29, 2017, will be the last chance to see the Spiritual Yards Home Ground of Jamaica’s Intuitives Selections from the Wayne and Myrene Cox exhibition, which closes on that day. There will also be a musical performance by emerging artiste Javada. Consisting entirely of works from the collection of Wayne and Myrene Cox Collection, the Spiritual Yards exhibition explores the work of Intuitive artists who produced sacred images and objects which are rooted in Revival religions, Rastafari or their individual spiritual beliefs, and are representative of the “spiritual yard” tradition in Jamaica, which is an important yet insufficiently documented part of Jamaica’s popular cultural heritage. Spiritual Yards features the work of ten such artists, namely Errol Lloyd “Powah” Atherton, Vincent Atherton, Everald Brown, Pastor Winston Brown, Leonard Daley, Reginald English, Elijah (Geneva Mais Jarrett), William “Woody” Joseph, Errol McKenzie, and Sylvester Stephens, along with rare photographs and video material on their life, work and spiritual yards from the Wayne and Myrene Cox archives. The exhibition has achieved significant visitor acclaim and is a must-see before it closes. Born Nevada Myrie, the deejay, lyricist and performer Javada grew up in East Kingston where he spent much of his time listening to and emulating his favourite deejays Bounty Killa, Shabba Ranks, Terror Fabulous and Buju Banton. Javada is a former member of dancehall star, Konshens’ Subkonshus Music Group label, and has performed on major stages in Europe, Africa, USA, and the Caribbean, as Konshens’ opening act. He has also recorded and released a number of songs with Konshens, most notably, Say Di Word (ZJ Liquid, H2O Records), and Gyal Dem Ready. His big voice, commanding stage presence, and a warm personality brought this dynamic deejay and songwriter to the attention of Spanish superstar singer, Enrique Iglesias, who featured Javada on the 2016 Billboard charting, ‘Spanglish’ remix of his song, Duele El Corazón (The Heart Aches). Javada’s music in 2016 also reached the international airwaves with the single Wake Up Beside You, on the Cold Heart Riddim (Robert Livingston, Scikron Entertainment) and the song has quickly become a regular choice on radio, club and sound systems playlists in several African countries and in the African Diaspora. 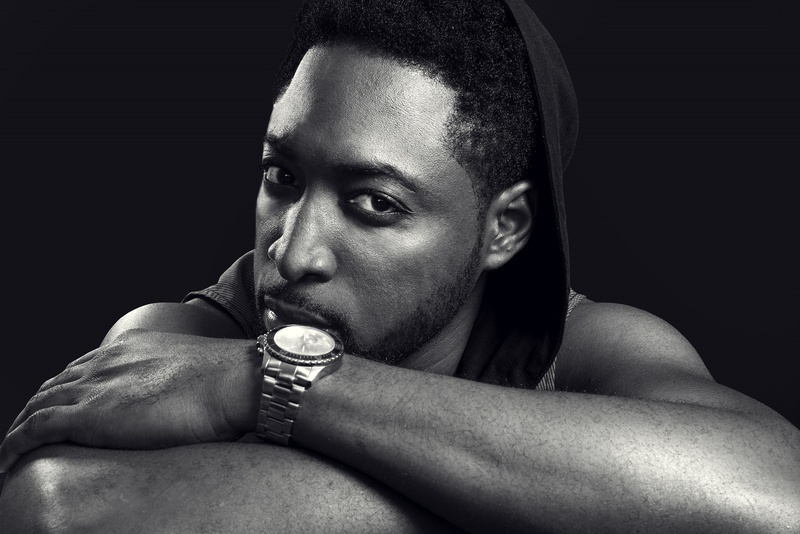 Javada’s most recent single, In Deh (Dre Day Productions) is on the same trajectory, receiving regular air and club play within the African Music market and also on local stations. The National Gallery of Jamaica’s doors will be open from 11 am to 4 pm on Sunday, January 29, 2017 and the musical programme will start at 1:30 pm. As is customary, admission will be free and there will also be free tours of the National Collection, but contributions to the National Gallery’s donations box are always appreciated. The National Gallery gift and coffee shops will be open for business and proceeds from these ventures help to fund programmes such as Last Sundays as well as our exhibitions. The National Gallery is pleased to present a special viewing of its current exhibition, Spiritual Yards: Home Ground of Jamaica’s Intuitives – Selections from the Wayne and Myrene Cox Collection, on Sunday, January 15, 2017. The Most Honourable Edward Seaga will deliver remarks and the collector Wayne Cox will be in attendance. The critically acclaimed Nexus Performing Arts Company will offer an exclusive musical tour of the exhibition. The Spiritual Yards exhibition, which opened on December 11, 2016, consists entirely of works of art and documentary material from the art collection of Wayne and Myrene Cox, a specialized collection of Jamaican Intuitive art. The exhibition explores the “spiritual yard” tradition in Jamaica, which is an important yet insufficiently documented part of Jamaica’s popular cultural heritage, and focuses on ten Intuitive artists who produced sacred images and objects for such yards and in most instances. The December 11 opening function also featured a musical tour of the exhibition presented by the critically acclaimed Nexus Performing Arts Company, whose deeply moving performance brought to life the cultural significance of the exhibition and the messages contained in the artists’ work. The performance was so powerful that it was decided to offer it a second time on January 15, 2017. The National Gallery of Jamaica will be open from 11 am to 4 pm on January 15, 2017 and the function and musical tour will start at 1:30 pm. Admission will be free and the public is invited. 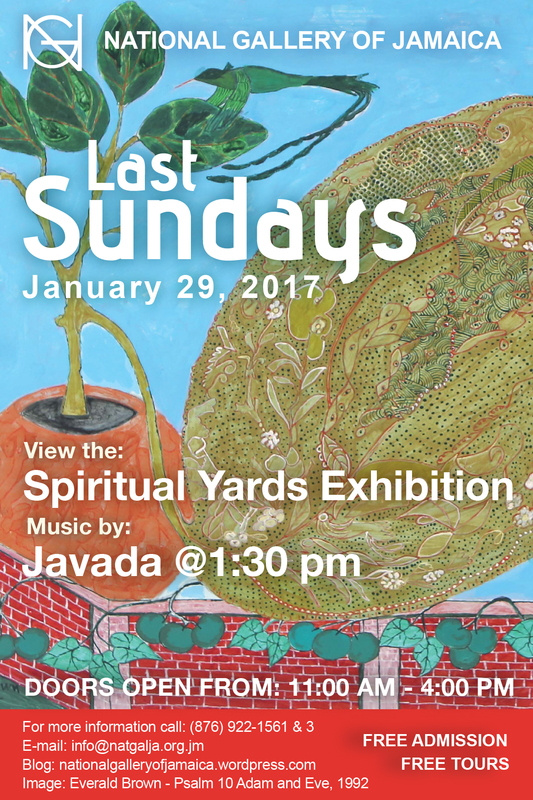 Spiritual Yards continues until January 29, 2017. The exhibition catalogue is available for sale in the National Gallery gift shop. Errol McKenzie – Balance of the Root of Christ (1998), Wayne and Myrene Cox Collection..
Errol McKenzie – Jesus Married to Satan: 30,000 Acres of Dead Food Kingdom of Darkness (1996), Wayne and Myrene Cox Collection..
Errol McKenzie – Rise of the Moon Mother (2008), Wayne and Myrene Cox Collection..
Errol McKenzie – Her Hair Is Music (2008), Wayne and Myrene Cox Collection..
Errol McKenzie – Moon Pelican (2003), Wayne and Myrene Cox Collection.. Spiritual Yards: Home Ground of Jamaica’s Intuitives – Selections from the Wayne and Myrene Cox Collection, continues until January 29, 2017, and explores the spiritual yard tradition in Jamaica, through ten Intuitive artists whose work is steeped in that tradition. The works of art and documentary material in this exhibition were selected from the Wayne and Myrene Cox Collection, a specialized collection of Intuitive Art. Here is the final of our posts on the artists in the exhibition, along with video footage, courtesy of Wayne Cox. Errol McKenzie (b1954) lives in Walderston in the hills of Manchester. His belief system is is based on his very own spiritual concepts. Aspects of his philosophy, for example, hold the moon as “the centre of energy and eternal power” and women as natural-born leaders. Nowhere is this best expressed by him than in the design of his home called Black Moon Island, home of the “Moon Mother”– an organically shaped stone-house which utilizes concrete wood to create a number of interconnected chambers of varying shapes. As an artist, McKenzie’s body of work includes woodcarvings, cemented free forms, stone arrangements and paintings, all of which display surrealistic elements. Similar to other Jamaican self-taught artists like Brother Brown, Errol McKenzie has a fair amount of international acclaim, having been featured in a number of overseas exhibitions as well as in international publications on “outsider art” such as Raw Vision magazine. Locally, McKenzie’s work has been widely exhibited including the National Gallery of Jamaica’s Intuitives series and Redemption Songs: The Self-Taught Artists of Jamaica (1997) organized by the Diggs Gallery, USA. He was awarded a Bronze Musgrave Medal in Art by the Institute of Jamaica in 1997. Elijah – Noah Warns the Nation of the Coming of God (1996), Wayne and Myrene Cox Collection. Elijah – The Angels of Deliverance and Light (1996), Wayne and Myrene Cox Collection. Elijah – The Conquering Lion Shall Loose Every Chain (1996), Wayne and Myrene Cox Collection. Elijah – King David House of Prayer (1996), Wayne and Myrene Cox Collection. Spiritual Yards: Home Ground of Jamaica’s Intuitives – Selections from the Wayne and Myrene Cox Collection, continues until January 29, 2017, and explores the spiritual yard tradition in Jamaica, through ten Intuitive artists whose work is steeped in that tradition. The works of art and documentary material in this exhibition were selected from the Wayne and Myrene Cox Collection, a specialized collection of Intuitive Art. Here is another post on one of the artists in the exhibition, along with video footage, courtesy of Wayne Cox. Elijah (b1952) – Geneva Mais Jarrett became ‘Elijah’ when she was baptised as a young adult. During the baptism, her pastor saw a vision of bands of angels around her along with the biblical prophet Elijah. From that moment, she took on the role of preacher and prophetess, creating the Elijah Tabernacle in her home in the community of Rose Town, Kingston. She consecrated the area by painting most of the outside surfaces of the building, gate and zinc fencing with mural scenes of angels and events of the bible. She also hung painted banners and seals, as well as set up revival basins. Her yard became a safe haven in tough times. She began to create similar scenes on canvas after becoming noticed by a Swiss patron who visited her yard. Later, she had her first exhibition in Switzerland in the early 1990s, including a one-woman show at Musee d’Art Brut in Lausanne. Her works have been featured in several exhibitions including Redemption Songs: The Self-Taught Artists of Jamaica (1997) at the Diggs Gallery, North Carolina USA and the Intuitives III (2006) at the National Gallery of Jamaica. Her work is in the permanent collection of Frost Art Museum, Miami. She closed her Revival yard sometime around 2000 and is believed to now be living and preaching in the USA. Sylvester Stephens – Henry, Spirit of the Clay (2004), Wayne and Myrene Cox Collection. Sylvester Stephens – Elsie (1998), Wayne and Myrene Cox Collection. Sylvester Stephens – Pat Man (1998), Wayne and Myrene Cox Collection. Sylvester Stephens – Snake Doctor (2003), Wayne and Myrene Cox Collection. Sylvester Stephens (b1956) was born in Brompton, St Elizabeth. He is known primarily for working with clay, from which he creates a number of forms that can be categorized as either vessels or figurative sculptures. Both these forms are often embellished with writings, such as Biblical quotations or other forms of decorative relief. Stephens, like a number of other self-taught artists of his calibre, actively engages with philosophies of spirituality. According to writers and commentators of his work, this was evident not only in the individual pieces but also in the way that he arranged his studio spaces. Randall Morris, in one account, describes entering Stephens’ roadside studio under a sign that said “Riding into Jerusalem” and further describes walking into a yard organized and decorated with coloured bamboo posts and pedestals upon which Stephens displayed his creations. The work of Sylvester Stephens has been exhibited in a number of group exhibitions, including Redemption Songs: The Self-Taught Artists of Jamaica (1997) at the Diggs Gallery in North Carolina in the USA and Prophets and Messengers (2000) at the Mutual Gallery in Kingston Jamaica, as well as Clay and Fire (2005) and Intuitives III (2006) both held at the National Gallery of Jamaica.